On Saturday morning, I spotted two interesting things on the way to the CNE. This strange Jeep-whatever hybrid (with Philippine flags in the windows) was parked in the bus bay of Dundas West TTC station. Regular civilians can’t park in there so I’m assuming its owner is a TTC employee. 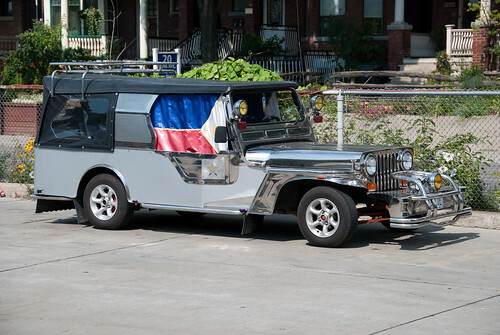 Strange Jeep, originally uploaded by cetaylor. 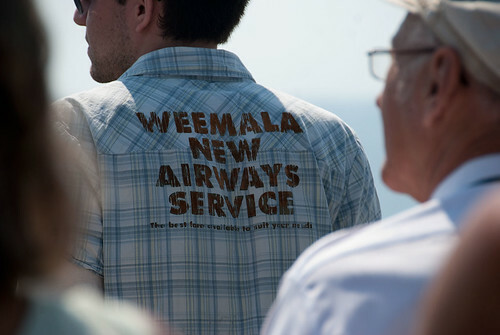 Then there was a fellow wearing this shirt, advertising one of our competitor airlines. Competing Airline, originally uploaded by cetaylor. Naturally, the discriminating traveller knows that cheap fares aren’t everything; Taylor Empire Airways provides the most luxurious and comfortable air liner service to Africa, India and Australia. UPDATE: Oh one other thing. If you ever take the TTC to The Ex then you owe it to yourself to take the 193 Exhibition Rocket from Dundas West station. That bus is express only between the station and Dufferin Gate, usually a 10-minute ride. It is much much faster and far less hassle than the Bathurst streetcar. For the love of Pete do not take the Bathurst car; it is slow, crowded, and will drive you insane. I have been to the CNE twice this year (Warrior’s Day and the air show), and for both inbound and outbound legs, the 193 Exhibition Rocket had less than a dozen people aboard and was very fast.